Estimation of DA from July 2015 – While All India Consumer Price Index for January 2015 had moved slightly upwards by one point from 253 to 254, it got neutralised as CPI-IW decreased by one point and moved back to 253 in the month of February 2015. Though Dearness Allowance for Central Government Employees and Pensioners with effect from January 2015 is yet to be approved by Cabinet, with all the indices from Jan 2014 to Dec 2014 have been officially released, DA with effect from January 2015 is confirmed to be 113%. 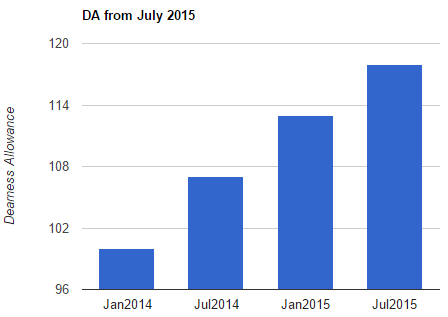 As far as DA from July 2015 is concerned we have CPI (IW) for 8 months out of 12 months. Considering the flat and decreasing trend in Consumer Price Indices in these eight months we have attempted to estimate DA from July 2015 in Four scenarios this time by taking assumed CPI for coming 4 months. Please note that this is merely an assumption based on the trend in CPI. Actual DA from July 2015 can be confirmed only if Govt approves the same. We do not expect this Scenorio of more Inflationary Trend and its impact of higher Consumer Price Indices in the coming four months from March 2015 to June 2015. However, we have attempted to find out the quantum of increase in CPI which is required to obtain 120% DA from July 2015 or 7% increase in DA from July 2015, i.e at least one percent additional increase of DA more than what is achieved in Scenario III with moderate inflationary trend. We could find that atleast two point increase in CPI for months of March 2015, April 2015, and May 2015 (CPI of 255, 257 and 259 in March 2015, April 2015 and May 2015 respectively), and then CPI of 262 for the June 2015 which is 3 point increase compared to May 2015, are required to obtain additional one point increase in DA from July 2015 (120% DA from July 2015) than DA of 119% from July 2015 estimated in Scenario III. Considering the movement of CPI in the recent past, we are of the view that Scenario IV coming to reality is most unlikely.